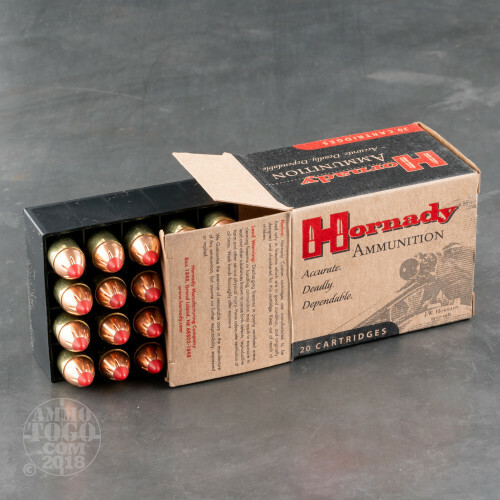 This is 45 Long Colt Hornady 225gr. 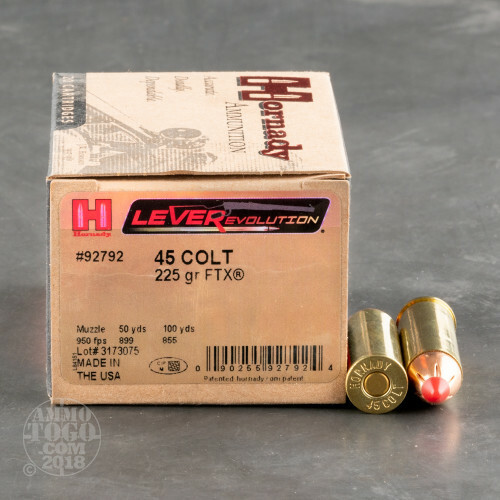 LEVERevolution Flex Tip Expanding Ammo. LEVERevolution is the most exciting thing to ever happen to lever gun ammunition. 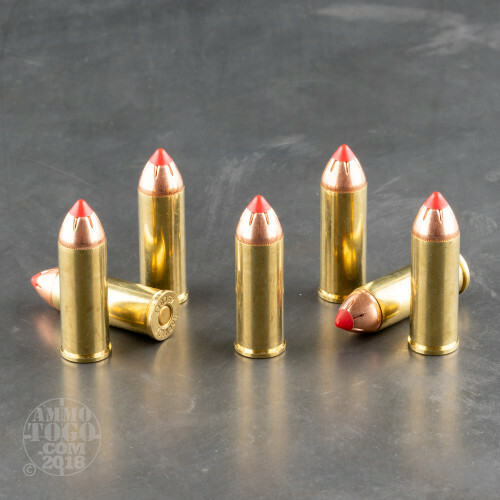 Hornady, the leader in ballistic technology, brings you an innovation in ammunition performance featuring state of the industry elastomer Flex TipTM Technology that is SAFE in your tubular magazine. Its higher ballistic coefficient delivers dramatically flatter trajectories for fantastic downrange energy increases and amazing bullet expansion at all ranges. LEVERevolution ammunition features up to 40% more energy than tradiional flat point loads and travels up to 250 fps faster. The 225gr. Flex Tip bullet has a muzzle velocity of 950 fps. This ammunition is safe to shoot in handguns and rifles. It truly is an evolution in lever gun ammunition! This ammo comes packed in 20rd. boxes. Accuracy is inconsistent out of my Circuit Judge. I shoot Hogs in my backyard and all bullets that have been retrieved did not expand. Two and one half inch groups at 100 yards! S&W 460 10.5" barrel. posted on 7/22/15 by Ron M.
Not very impressive out of a Henry Steel Big Boy, fair accuracy but inconsistent penetration on game. Buffalo Bore 225gr LSWHP and 255gr Keith bullet loads are far more effective in deer and hogs. This has to be the finest, cleanest burning ammo I have ever used in 45LC. Very accurate to say the least, especially when I use a bench rest for shooting at 100 yards with my Taylor Lever action rifle. Holds a very tight group and is very reliable. I use it in my Ruger Vaquero revolver and can hold 2" groups at 25 yards. Also love shooting it with my S&W Judge. I have shot over 1000 rounds of this ammo and have Never had a failure or misfire. Well worth the buck! posted on 2/25/15 by Bob B. A pleasure to shoot. Tried this with a few other brands yesterday. This was by far the cleanest burning round of them all. My 6-1/2 barrel raging judge magnum barely kicked at all with very little smoke. I will buy a lot more of this ammo. OUTSTANDING! This round is an extreme improvement on what used to be the 'norm' or more appropriately; what was available on the market. You know what I am speaking of - the light load 'cowboy' rounds that have been around forever. I believe the recent introduction of and the eventual public acceptance of "wheel guns" as an HD alternative has created the need for such rounds as this. Hornaday DOES NOT DISAPPOINT with this devastating, clean burning and extremely effective round. Like another commentator - I use this in my Taurus Judge, along with some choice nasty .410 bore shot shells. I also use this in my Henry Big Boy chambered for 45 Colt. In both weapons this round has delivered consistent results and has out performed ALL THE REST! HOOYAH! HOOYAH! HOOYAH! To "Ammo To Go" for offering the best of the best, always. I wanted some of the best for my Ruger Vaquero Single Action revolver that had more velocity and kinetic energy than the anemic rounds still on the market for the 1800's relics still about! Hornady once again came through! I almost exclusively use Hornady for my Marlin 1895G lever action rifle in .45-70 already, and this .45 Long Colt load doesn't miss! I highly recommend it, especially as I already have hundreds of rounds of it, before this Second Coming of The Obama Ammo Apocalypse! Should have seen it coming after 2008, people! Great energy, accuracy and velocity! I actually carry the Ruger in a shoulder rig, a vertical leather Bianchi rig, as a self defense weapon. Not because I have only the Single Action to carry....because I can! 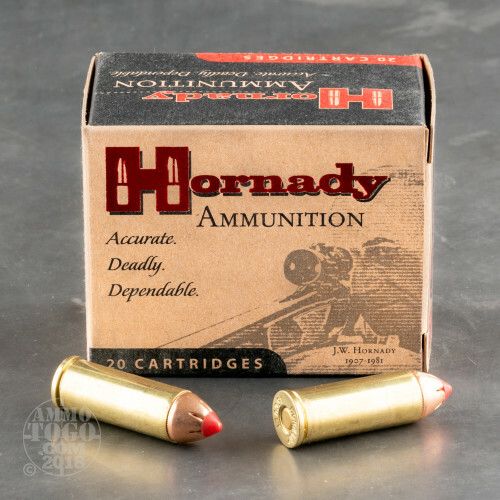 Another awesome Hornady product! Very accurate nasty stuff, I love it!!! I shot this out of my Taurus Judge Magnum without any problems and have never heard anything bad about Hornady ammo. Burns really clean too. I load these in the gun for HD along with Winchester DPX1 .410. I will be buying more of this. Looking at getting a Chrono soon too and when I do. There will be some testing going on and I'll post what I find through the Judge. I am a long time .45LC fan. I currently own more than 5 guns that utilize this caliber. I enjoy cowboy shooting. I however really make best use of this round in my Taurus thunderbolt pump action rifle (which by the way can be slam fired "hold the trigger and just keep pumping 15 rounds") Wild boar don't stand a chance. Perfect hunting round. Never tried it out of a pistol however, so no comment there. I would recommend any Corbon though for that.